Cedars Remains Top-of-Mind with IgnitionWeb. Cedars is a non-profit organization aiming to improve the lives of cancer sufferers and their loved ones through their diverse research, patient care and cancer education programs. As Cedars depends on donations and the time and effort of their dedicated volunteers to provide their services, keeping the organization's worthy cause top-of-mind is always a priority. 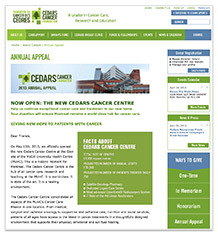 Increasing the frequency of Cedars site updates will maintain public awareness of their message, mission and accomplishments while enhancing their fundraising efforts. In 2008, Cedars wanted to refresh their public image with a new website to promote their events and achievements by redesigning their site and expanding their IgnitionWeb back-end. HTC sought to maximize the impact of the Cedars homepage with dynamically-updated content to promote current events and initiatives. 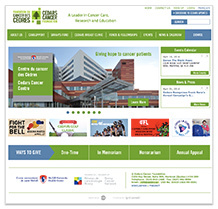 Search Engine Optimization and greater emphasis on online donations will help to keep Cedars moving towards their goals. At the end of 2010, HTC re-launched the Cedars website with a facelift, featuring an increased focus on fundraising and online donations. Additionally, we implemented a wider 1024x768 layout to accommodate today's ever-growing monitor aspect ratios. HTC created two new managers tailored specifically to the needs of the Institute. Donations Manager allows Cedars to easily and securely administer donations, gifts, memorials, and honorariums made through their fully transactional site. In addition, Fundraiser Manager gives them the ability to create, archive, and reactivate important fundraising events and activities. Online registration and payment for their golf tournaments, Dragon Boat races, raffles, Tour de Lance rides, 401 Bike Challenges and other events are easily managed in the back-end. The Cedars Breast Clinic is excited to have more prominence on the Cedars site—rendering more awareness for the referral centre that participates in the critical multi-centric clinical research trials that shape the future of breast cancer care. The Cedars Board is thrilled with the site, its interface & usability, their IgnitionWeb installation, its functionality and ease-of-use. They have received a lot of positive feedback on content and presentation.